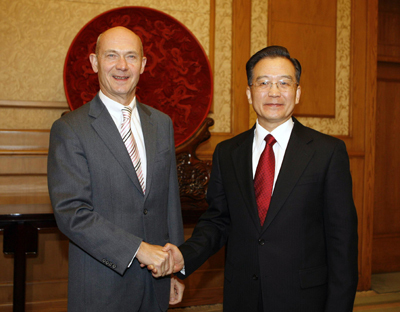 BEIJING - Chinese Premier Wen Jiabao said on Monday in a meeting with World Trade Organization Director-General Pascal Lamy that China will firmly continue its opening up. "China will firmly insist on its reform and opening up, and is ready to develop trade, economic and technological cooperation with other countries in a fair and open environment," Wen told Lamy. He said the conclusion of the Doha Round talks will be undoubtedly conducive to the realization of open and predictable trade and the steady development of world economy. "China supports all concerned parties to actively promote the Doha Round talks at the current basis, and hopes that the talks will finish with success as soon as possible," said Wen. Lamy said the the success of the current Doha Round talks, which are now at a crucial moment, would be the most effective way to contain trade protectionism, and he hoped China will continue to play an active and constructive role in the talks.